Mario Day (also written as Mar10 Day) is an annual celebration of the entire Mario franchise. It takes place on March 10th each year, the reason being that this date, written as "Mar10", looks like Mario's name. The holiday could be celebrated by dressing up as Mario, having a Mario-themed party, or simply playing Mario games, among others. Although the holiday was not created nor declared by Nintendo, the day was unofficially celebrated by most Mario fans. Since 2016, Nintendo has officially embraced the holiday and started celebrating annually by promoting Mario games and holding Mario-themed events. On an American Broadcasting Company news broadcast on March 10, 2017 the headline "National Mario Day" was played celebrating Mario Day where the reporter talked about Mario Day, its name and Mario. In 2016, Nintendo celebrated the holiday by releasing a video on their official YouTube channel titled "Celebrate Mar. 10 - Mario Day!". The video is about a person in a Mario costume walking around Nintendo's office turning things into Mario-related objects such as turning notepads into Nintendo 3DS systems. The person also adds Mario-related stuff to the office such as several Mario plushies to a person's desk. In 2017, Nintendo celebrated the holiday by adding a free Mario-themed frame to Facebook and the Messenger Camera that could be used from March 10 at 5 a.m. PT until March 12 at 11:59 p.m. PT., by putting several Mario games on sale on Amazon, and by having several My Nintendo rewards for Mario titles such as a 30 percent off discount on Mario Kart 8. They also worked with the Starlight Children’s Foundation by providing new designs for their gowns while making a donation to create 2,000 gowns. In 2018, Nintendo partnered with Google adding Mario in Google Maps, where the user can have Mario drive around in a Pipe Frame. Users had to look for a ? Block next to the start button when the start and destination fields were filled. Nintendo also held an in-game event in Super Mario Run, called "It's All About Mario Event", where all Mario-related items are in fixed appearance rates in Super Bonus Game. At the same time, Nintendo offered a special 50% discount for the full game. Several rewards for My Nintendo include the "Mario's Mighty Mustache" 3DS theme. Special events for Mario Day were held in other Nintendo games. In Animal Crossing: Pocket Camp, Mario series items were available to craft for a limited time. In 2019, Nintendo released a promotion in Europe where buyers who purchased Super Mario Odyssey, New Super Mario Bros. U Deluxe, Mario Kart 8 Deluxe, Super Mario Party, or Mario Tennis Aces between the 8th and 10th of March would receive double Gold Points. In North America Nintendo released several My Nintendo discounts on Mario games, discounted download codes for the games that where included in the My Nintendo promotion in Europe to cost $39.99 from participating retailers, and discounted Nintendo Switch systems with one of five select Mario game to cost $329.98. Nintendo also released an episode of Nintendo Minute on their official YouTube channel titled "Mar10 Day Character Bracket: Mario’s Enemies - Nintendo Minute". In this video, series' hosts Kit and Krysta rank several Mario enemies based on several categories, such as which would be the most annoying pet. 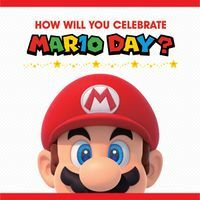 Nintendo of America made a celebratory tweet for the holiday asking how fans will celebrate Mar10 Day. There were also several Mario-related activities that took place at the Nintendo New York store, which were sponsored by Frito-Lay Variety Packs. The event "It's All About Mario Event" returned in Super Mario Run, and the player were given 10 Rally Tickets as a log-in bonus. In Animal Crossing: Pocket Camp, Mario's hat and outfit were gifted for all players, and several Mario-themed wallpaper and flooring were available for crafting. Several of the furniture from the prior Mario-related event returned, and the Fishing Tourney 12 for the game featured Cheep Cheeps, Eep Cheeps, Cheep Chomps, and Bloopers as catchable fish. ↑ 1.0 1.1 Nintendo of America (March 8, 2019). Celebrate Mar10 Day with sales and more. Nintendo. Retrieved March 9, 2019. ↑ 2.0 2.1 Nintendo of America (March 9, 2016). Celebrate Mar. 10 - Mario Day!. YouTube. Retrieved May 13, 2017. ↑ NATIONAL MARIO DAY – March 10. National Day Calendar. Retrieved May 12, 2017. ↑ 10th March will be... Mario Day. Days of the Year. Retrieved May 12, 2017. ↑ Fun Holiday – Mario Day. TimeAndDate.com. Retrieved May 12, 2017. ↑ 6.0 6.1 6.2 Nintendo of America (March 9, 2017). Nintendo celebrates Mar10 Day by bringing smiles to people of all ages. Nintendo. Retrieved May 12, 2017. ↑ 23 ABC News | KERO (March 10, 2017). Happy National Mario Day. YouTube. Retrieved March 10, 2019. ↑ GameXplain (March 9, 2018). Google Maps Mario Kart Easter Egg Celebrates MAR10 Day! (iPhone & Android). YouTube. Retrieved March 8, 2019. ↑ 9.0 9.1 Nintendo of America (March 3, 2018). Happy MAR10 Day!. Nintendo. Retrieved March 11, 2019. ↑ animalcrossing (March 10 2018). Happy Mario Day! We're celebrating with the Super Mario Crossover Event. Craft Mario-themed items such as the Super Mushroom and big bro's tee! #PocketCamp. Twitter. Retrieved March 11, 2019. ↑ animalcrossing (March 10 2018). Time to craft some SUPER cool items! During Round 1 of the Super Mario Crossover Event, you'll have a chance to dress like the man himself! #PocketCamp. Twitter. Retrieved March 11, 2019. ↑ Craddock, Ryan (March 8, 2019). Get Double Gold Reward Points When Buying Top Mario Switch Games This Weekend (Europe). Nintendo Life. Retrieved March 8, 2019. ↑ Craddock, Ryan (March 4, 2019). Nintendo Celebrates Mario Day With Lots Of Mario Game Discounts (North America). Nintendo Life. Retrieved March 8, 2019. ↑ 14.0 14.1 Craddock, Ryan (March 8, 2019). The Mario Deals Just Keep Coming With Savings On Games And Switch Consoles In North America. Nintendo Life. Retrieved March 8, 2019. ↑ Nintendo of America (March 8, 2019). Mar10 Day Character Bracket: Mario’s Enemies - Nintendo Minute. YouTube. Retrieved March 9, 2019. ↑ NintendoAmerica (March 7 2019). Wahoo! It’s almost March 10, and that means #MAR10Day is just around the corner! How do you plan on celebrating our hero’s special day?. Twitter. Retrieved March 9 2019. ↑ animalcrossing (March 10, 2019). Did you know that March 10th is Mario Day? I didn't realize why until someone wrote "Mar. 10" as the date on a campsite document. Hehe! To celebrate our favorite mustachioed man's special day, we're giving everyone a Mario Hat to start! More gifts and events are on the way, too!. Twitter. Retrieved March 11 2019. ↑ animalcrossing (March 10, 2019) As part of the Mario Day celebration, we're releasing a special Super Mario Wall & Floor Collection! Use the items from this collection to make your cabin look like a level from a Super Mario game, and then pose for a photo in your new Mario outfit! Yippee!. Twitter. Retrieved March 11, 2019. ↑ Nintendo Wire (March 14, 2019). Jump up and join in Pocket Camp’s Mario themed fishing tourney!. Nintendo Wire. Retrieved March 15, 2019. This page was last edited on March 15, 2019, at 14:37.